The year 1290 is Catherine's fourteenth year, and the year in which she has promised her brother Edward she will write an account of her days. Her diary, which marks time according to Saints' feast days, tells of her contentious relationship with her father, her worries for her mother's health, her observations as friends and relatives marry and bear children, and her disgust for Shaggy Beard, the man to whom her father wishes to marry her off. There is one thing that bothers me about this book, which is that it shows a young girl self-aware enough to flout the feminine conventions of her day. While Catherine's antics are funny and give the story a definite sense of "girl power" they come across as inauthentic because they are so unlikely. During this time period, a woman in Catherine's position - the daughter of a powerful man with a fierce temper - would likely do as she was told because there was no other option. She would not have role models to show her that anything happening in her life was unfair or wrong, and she would likely not have the luxury of talking back to adult authority figures. Maybe that wouldn't make as interesting a story, but it bothers me that the author seems to be incorporating contemporary values into a society that could not even begin to comprehend them. That said, this book does include a lot of secondary details about the time period that are utterly realistic. Simple things like tooth decay and childbirth are handled in ways that to contemporary Americans seem bizarre and terrifying. The idea that Catherine's father would have a vein opened under his tongue to let out the "bad humors" supposedly causing his toothache made me wince, not just because it would be so terribly painful, but because advances in science have shown how ridiculous an approach this would be. I almost couldn't even read the sections talking about what happens to Catherine's mother after her baby is born. It makes me thankful to live in a time where babies can be born in hospitals, and infections can be treated with drugs. Another thing I really loved about this book was all the information about religious practices. As a practicing Catholic, I love to see the Church represented respectfully in fiction, and it can be difficult to find books that are both well-informed on the subject and well-written. This book is both (which is especially pleasing to see given the poor treatment of religion in another of the author's books, The Loud Silence of Francine Green.) I enjoyed Catherine's description of the Saint for each day, and I liked the details about going to Mass and observing Lent. 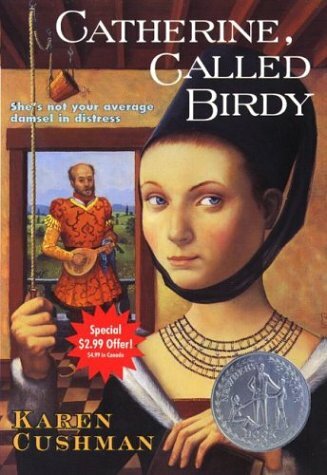 Catherine, Called Birdy is a good choice for kids who have a hard time contextualizing history lessons, as it humanizes this time period and keeps a fairly light-hearted tone despite many dark moments. While it would not be a sufficient study on the Middle Ages all on its own, the story makes a nice jumping-off point for teaching about day-to-day medieval living.